Haley Cook of Marysville maneuvers through the high water on Saturday at Watkins Memorial High School. 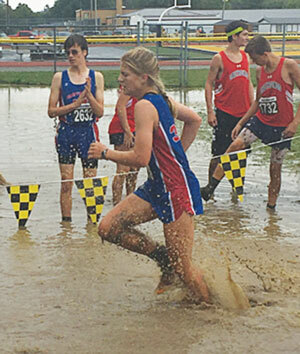 Several local cross-country teams competed at the McGowan Invitational despite the rain and mud. The extremely wet weather presented a huge challenge for area cross-country runners on Saturday. Squads from Jonathan Alder, Marysville, Fairbanks and North Union competed in the various divisions of the McGowan Invitational at Watkins Memorial High School. The Jonathan Alder girls slogged their way to a first-place finish during the Division II race, while Fairbanks’ girls placed third in the D-III meet. The Lady Monarchs of Marysville were fourth during the Division I competition. Jacquelyn Witt of MHS was seventh during the Division I race with a time of 21:44.2, followed by Katie Krueger, 17th, 22:30.8; Maddie Sundquist, 20th, 22:41.3; Leanne Eichorn, 36th, 23:40.6 and Kayla Michalak, 50th, 24:32.6 to round out the team’s scoring. The JA girls captured top honors in the D-II race with 79 points, easily outdistancing runner-up Bexley, which had 88. Centerburg (82) and Northmor (123) finished first and second in the girls’ D-III meet. FHS’ girls finished with 128. The Lady Panthers nipped Fairfield Christian (131) to place in the top three. Olentangy Liberty won the girls’ big-school category with 46. Lancaster was second with 97, Upper Arlington tallied 112 and the Lady Monarchs finished with 130 to round out the top four of the 18-team race. Maddie Davis of Alder won the D-II girls’ individual race with a time of 19:57.7. North Union’s girls were 18th in the 25-team D-II race. Jonathan Alder’s boys placed third with 99 points during the Division II boys race of the McGowan Invitational. Heath won the race with 85 points and Unioto (95) was the runner-up during the 26-team event. North Union was 11th in the same meet with 326 points. The top five runners for the Pioneers were Gavin Frick, second, 17:10.0; Luke Malone, sixth, 17:33.4; Michael Gray, seventh, 17:47.4; Grant Welsch, 39th, 18:52.5; and Zach Hicks, 45th, 19:01.4. Adam Brown was NU’s top placer with a 36th-place slot of 18:46.0. Joel Krebehenne was 63th in 19:28.5, followed by Jacob Willis, 68th, 19:38.7; and Gabe Burggraf, 94th, 20:22.1. Marysville’s boys placed 11th in the 19-team Division I race. Adam Platt of MHS was second overall in the boys’ JV race. His time was 19:56.4. Fairbanks’ boys were 14th in the 19-team Division III race.